The USS GRAND CANYON (AD-28), a Shenadoah class destroyer tender, was commissioned on 5 APR 1946. USS GRAND CANYON served her country for 32 years, 4 months and 27 days, until decommissioned on 1 SEP 1978. Built in Tacoma, Washington, USS GRAND CANYON was launched in April 1945, but with World War II ebbing, was not commissioned until April 1946. After shakedown, GRAND CANYON transited the Panama Canal in July 1946 and sailed on to her homeport of Newport, RI. In September 1946 she began a long series of Mediterranean deployment that lasted through out her entire career. GRAND CANYON tended the destroyers serving as the Cuban Blockade force in October 1962. GRAND CANYON was re-designated AR-28, a general purpose repair ship on 11 March 1971. She continued living up to her motto, "CAN DO", until her decommissioning in September 1978. USS GRAND CANYON was scrapped in 1980. Grand Canyon (AD-28) was launched 27 April 1945 by Todd-Pacific Shipyard, Inc., Tacoma, Wash.: sponsored by Mrs. W. L. Mann; and commissioned 5 April 1946, Captain W. D. Hoover in command. After brief shakedown off the coast of southern California Grand Canyon departed Port Townsend, Wash., 26 June 1946 en route Newport, R.I., via the Canal Zone. She arrived Newport 20 July. Assigned the task of keeping our destroyers in operation, Grand Canyon cleared Newport 17 September 1946 for her first tour with the 6th Fleet in the Mediterranean. After a visit to Palermo, Sicily, and a 41/�-month stay at Naples she returned to the States, arriving Norfolk 1 March 1947. Between 1 November 1947 and 12 November 1954 Grand Canyon continued her support of 6th Fleet destroyers, making six Mediterranean deployments. During this time she participated in some of the largest peacetime service operations ever undertaken. Grand Canyon continued her tender duties in the U.S. until 24 September 1956 when she again departed for the the Mediterranean for her eighth tour. By 20 October the Suez Crisis had reached the serious stage and the majority of the 6th Fleet proceeded into the Eastern Mediterranean. During this period Grand Canyon, as flagship, took part in fleet exercises and visited the ports of August Bay, Sicily; Messina, Sicily and Taranto, Italy. As the Suez problem subsided she sailed for Cannes, France, 20 December, in time for the Christmas holidays. Grand Canyon returned to Fall River, Mass., 13 March 1957. The third of September 1957 found Grand Canyon underway with other units of the Atlantic Fleet, this time to participate in NATO fall exercises. By the 16th she had crossed the Arctic Circle operating west of Norway. After visits to Trosmo, Norway and Portland, England, Grand Canyon returned Newport, R.I. 21 October. Grand Canyon continued her tender duties out of Fall River, Mass., until 1 August 1958 when she sailed for Suda Bay, Crete, to support the 6th Fleet in operations off Lebanon. For the next 4 months she supported destroyers and other types while helping to stabilize the situation and block aggression in Asia Minor. Besides Suda Bay, Grand Canyon visited Izmir, Turkey; Athens, Greece; Naples, Italy; and Barcelona, Spain, before returning home in December. Grand Canyon spent most of 1959 with tender duties at Newport except for duty at Charleston, S.C., between 29 August 1959 and 11 January 1960. She cleared Charleston 11 January 1960 to participate in Operation "Springboard," returning to Newport 7 February; thence to Bermuda and New York before returning to Newport. Between October 1960 and August 1961 Grand Canyon tended ships at Newport, Boston, and Norfolk. After her ninth Mediterranean tour August 1961 to March 1962 Grand Canyon returned to Newport and again took up her duties there until the fall. 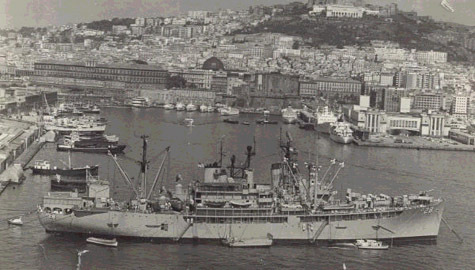 She proceeded to San Juan, P.R., arriving 3 November 1961 to start tending ships of the South Atlantic Blockading Fleet during the Cuban missile crisis and subsequent quarantine. Grand Canyon again helped demonstrate the mobility and versitility of sea power. She returned to Newport 5 December. Grand Canyon made her tenth deployment to the Mediterranean between 6 February and 27 June 1963. The ship entered Bethlehem Steel Yards, East Boston, Mass., for modernization and refitting. With the completion of modernization 3 January 1964, Grand Canyon sailed for Guantanamo Bay and San Juan, P.R., on training cruises. Returning to Mayport, Fla., 11 May, she tended destroyers there until her departure for Newport, R.I., 20 June for similar duties at that station. On 27 November, Grand Canyon, departed Newport for her llth Mediterranean cruise, relieving Shenandoah (AD-26) as 6th Fleet tender. She reached Palma, Mallorca, December and until 16 April 1965 tended ships in French, Italian, and Spainsh ports. After returning to Newport 27 April, she served there and at Norfolk, Va., during the next 11 months. Between 29 March 1966 and 12 August she again served ships of the 6th Fleet in the Mediterranean. During the remainder of the year she operated out of Newport.� Into 1967 Grand Canyon continued to provide tender and repair facilities for destroyer-type ships of the Atlantic Fleet and the mighty 6th Fleet.